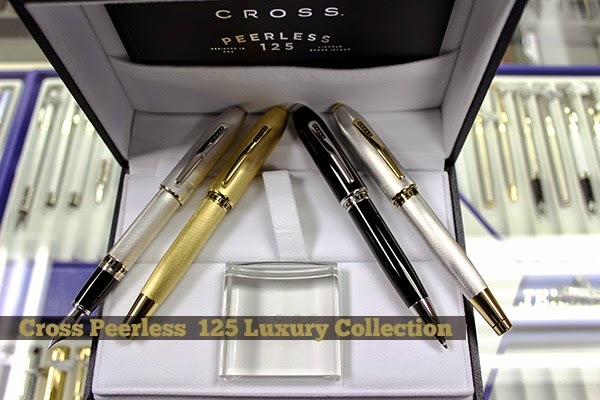 The newest pen in the Cross Luxury collection is the Peerless 125. The original Peerless pen was introduced by Cross in 1889. These pens are beautiful in their finishes of Black Lacquer, Platinum and 23k Gold Plate. Each pen has an individual serial number, on the cap, that you can register with Cross. The Navy Blue and White box is a show piece on its own. The inside is white velour and each pen comes with a clear Cross pen stand for displaying. The Obsidian Black Lacquer has the Platinum trim, the Platinum is available with either Platinum or 23K Gold plated trim and the 23K Heavy Gold Plate is all gold plated. The top of each pen has a Swarovski faceted cut crystal. The pens have the legendary Cross lifetime mechanical warranty. The combination of classic Cross style with a gorgeous finish, makes these pens desirable as an heirloom to be passed down to future generations. The Fountain Pens all come with a solid 18K Gold/Rhodium plated nib and are available in a Fine or Medium size. The cap is threaded and weighs 1.5 oz. It is 5.7" capped and 6.16" posted. Price range is $450.00 to $550.00. The Rollerball cap is threaded and weights 1.8 oz. It has the same dimensions as the fountain pen. It comes with the Black Cross Gel Rolling Ball refill. The refills are available in Black, Blue, Red or Purple. Price range is $225.00 to $325.00. The Ballpoint pens arrive with the Black Medium Satnink refill. Additional refills are available in Black or Blue, Fine or Medium. It weighs 1.5 oz and it 5.68" long. Price range is $175.00 to $275.00. This is not a review. The fountain pen is also available with a zoom nib.